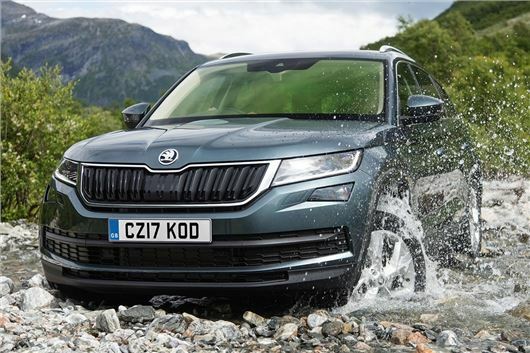 Skoda has announced pricing for the Kodiaq, which will be available to order in November from £21,495, with first deliveries following in April 2017. From launch there will be five engine options and four trim levels. Standard equipment on basic models includes keyless entry and start, a touchscreen, air conditioning and smartphone connectivity. The entry-level engine is a 125PS 1.4-litre TSI, which is only sold in conjunction with a manual gearbox. A 150PS 1.4 TSI is also available, along with a 2.0-litre TSI with 180PS. The diesel option is a 2.0-litre, but with a choice of 115PS, 150PS or 190PS. The most powerful petrol and diesel models are only available with all-wheel drive and a seven-speed dual clutch auto. The basic S trim level is only offered with the 125PS 1.4 TSI and comes with LED running lights, 17-inch alloy wheels, multifunction steering wheel, manual air conditioning, keyless entry and start, a touchscreen, DAB radio, autonomous emergency braking and smartphone mirroring. It is available with five seats only. SE trim is priced from £22,945 and gains larger, 18-inch alloy wheels, privacy glass, cruise control, reversing sensors, a larger touch screen, dual-zone climate control, auto lights, auto wipers and an auto-dimming rear-view mirror. Two additional seats are available optionally for £1000. SE L comes with seven seats as standard, a power tailgate, 19-inch alloy wheels, navigation, a WiFi hotspot, drive mode select, Alcantara upholstery, heated front seats and LED headlights. Top ‘Edition’ models gain leather upholstery, metallic paint, chrome roof rails, lane assist, auto high beam, wireless phone charging and blind spot detection. Various advanced technologies are available, some optionally, including a system that assists when reversing a trailer, plus adaptive cruise control, traffic sign recognition and parking cameras that can generate a virtual top-down view of the car when manoeuvring. ‘Simply Clever’ features include a gadget to protect against door dings.